Something has you looking at personal trainer profiles. You may be ready to take the next step – maybe even a first step – toward a healthier, more fit life. If so, Kim can help you. She has been helping people set and meet their personal fitness goals for 23 years. You are busy and maybe a few other things as well: tired or out-of-shape or lacking in motivation. 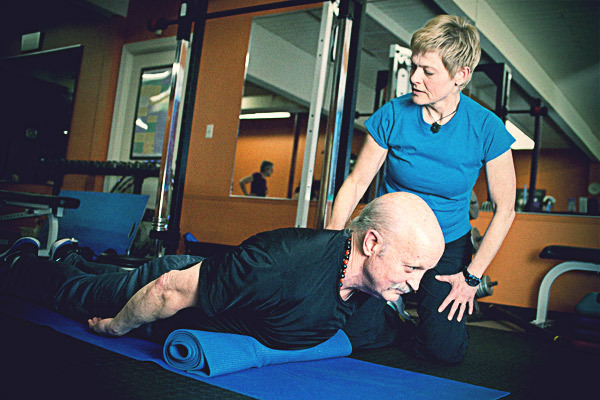 Maybe you are recovering from an injury or getting older and wanting to prevent one. She specializes in overall fitness, weight loss, post-injury rehabilitation, chronic fatigue, and fibromyalgia. She develops personalized fitness plans for every client. Fitness plans typically include strength training and recommendations for aerobic activities. As a registered yoga instructor she often incorporates yoga poses as well. Strength, energy, fitness, flexibility…all can be obtained over time by making healthy changes in your life. As your fitness level improves so will your confidence and self-esteem. We start wherever you are and work from there! Why not get started now? KIM HAS MON/WED 6:00A.M. SMALL GROUP TRAINING AVAILABLE TO SHARE WITH ONE OTHER INDIVIDUAL. IF INTERESTED PLEASE EMAIL OR CALL. Get started with Kim today. Email or call 206-782‑2199 for a FREE, no-pressure consultation. I came into see Kim because I was having trouble getting up off the floor and I wanted to find ways to include more strength training in my life. The programs that Kim developed have really helped. I’ve been amazed at the weight I can now lift, without a problem. In addition, I’ve found that I’ve been inspired to do the programs, on my own, at home. She has developed programs that work in my harried schedule and around my specific needs. Kim is patient and knowledgeable. I’ve been amazed at how much I’ve learned about doing exercise in the correct way (no wonder I kept hurting myself!). Her friendliness and the way that she balances kindness with pushing me to stretch past my fear make workouts with her a pleasure. I recommend her highly with no reservations! I have been working with Kim twice a week for overs five years now and it has been a great journey so far. At 62 I was slowly losing strength and balance as I aged. I wanted to stay fit and mobile for the activities I love like gardening and playing with my grandchildren. Kim has a special talent for designing routines that challenge and teach whatever one’s initial physical condition. She has had years of experience as a yoga teacher and as a personal trainer. She teaches one to do the exercises correctly, thus maximizing gain and minimizing injuries. I have especially enjoyed noticing my abilities and strength increase, for example, I can now turn the bar which shuttles my grandchildren back and forth on a little tram at the playground…two years ago, this was not an option. I can balance on one leg to get into my jeans and I can get up from almost any chair with ease. I’m not always happy to go to the gym at 7am, but I’m always happy that I did. I really enjoy working with Kim. Her laughter filled, fun way of being, makes the training easeful and light, while really getting the work done. She has a way of approaching my training routines that keeps them fresh, interesting and most importantly, effective. I highly recommend Kim to anyone who wants their workout to be highly impactful and can do without the grind. I recently celebrated my 50th birthday. Because I’ve been working out with Kim for the past six years, I was able to approach this milestone far more fit and confident than I ever would have been without her. In fact, because Kim has helped me become so much more physically focused, I feel younger now than I did five years ago! varies the routines often enough to keep them fresh. She takes into account the whole person, with attention to balance, coordination, strength training, and engaging ones core. When I started working with Kim, we had weekly sessions. With her support, Ive developed the confidence (and discipline a new thing for me!) to work with her once every other week, and work out the rest of the time on my own. She gives good direction and coaching, and manages to (gently) hold me accountable. I feel very lucky to have found this level of expertise and support. I’ve been taking yoga classes with Kim for over six years now. In addition to relieving stress, Kim’s class has done wonders for building my strength and stamina. Practicing yoga provides me with quiet times throughout my week to relax and focus on how I’m feeling, without distraction. Kim also worked with me to customize a strength/resistance training program that I can do at home. She instructed me about what equipment to buy, how to use the space I have, and went through the routine with me to make sure I had a thorough understanding of it. Now I can train at home a couple of times a week without having to travel to a gym. Kim is an excellent and knowledgeable teacher who always provides feedback and encouragement. I highly recommend her yoga classes and personal training services. My husband Verlin observed Kim working with her customers, and was very impressed. He contacted her to see if she would be willing to work with me. Many years ago I was diagnosed with Chronic Fatigue. After trying several forms of exercise, I would usually end up exhausted. Now, after my sessions with Kim, I have more energy and I love doing my exercises. Thank you, Verlin, for contacting Kim for me.